Sergeant Stubby has been called the most decorated war dog of World War I, but his story starts back in America. When the 102nd Infantry Regiment was training on the Yale University campus in July 1917, they fell in love with a local stray. When it came time to head overseas he was smuggled onboard a ship by Private J. Robert Conroy. When the canine stowaway was discovered aboard, he was able to escape stowaway charges when he saluted the commanding officer. Thus, he was unofficially drafted into the army, and went through battlefield training with the men in France . He took part in many skirmishes, even getting wounded in April 1918. Sent to the hospital, he inspired his wounded comrades before being shipped back to the trenches. Stubby had a few advantages over his comrades. Knowing the signs of an upcoming gas attack, he was able to give his men a few minutes of warning, allowing them to put on their gas masks before the poisonous cloud enveloped them. 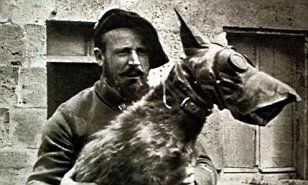 Not just an early warning system, the dog also captured a German soldier by himself, and after getting separated from his unit during the chaos of war he was even embedded with French forces for a while. When the war ended, Private Conroy again smuggled Stubby back to America and for a while toured with the dog, who had by then become a celebrity. While Conroy attended Georgetown University, Stubby became the official mascot. He eventually retired and in 1926 passed away. To honor his legacy, he was stuffed and donated to the Smithsonian, where he is still on display. 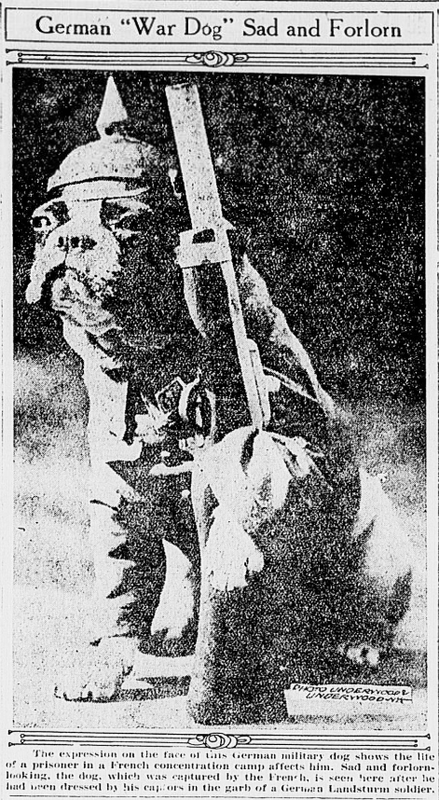 Mutt was a French Bulldog working with the US 11th Engineer Battalion. The 11th Engineers were one of the first American units to taste combat when they were forced into battle after the Germans overran the British front lines. Working as a YMCA cigarette delivery dog, Mutt kept up morale and was a welcome distraction for the men from the horrors of war. He’d race through the trenches, bringing the soldiers cigarettes and brief companionship to calm their nerves and keep them from cracking. Mutt continued his job even though he was wounded twice. Decades before Lassie was on TV, there was Tom. 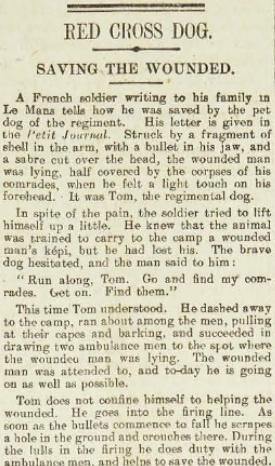 Tom was a French ambulance dog saving lives on the front. A 1914 article tells of just one of the lives he saved, a French soldier whose name was withheld for security reasons. After a particularly harsh battle, this French soldier recalls being paralyzed after a head injury but also slowly dying from an arm wound. A bullet in the jaw prevented him from screaming out. Pinned down by the corpses of other brave French soldiers, he had almost lost hope when, suddenly, he felt a wet nose on his brow. While he looked dead, Tom could sense life in the French soldier. French ambulance dogs had been trained to take a wounded man’s military cap, or képi, to the stretcher bearers, alerting them to the presence of a hurt soldier. However, the French soldier had lost his hat in battle. After hesitating for a bit, Tom raced off to get help. With no képi he was first ignored, but finally he was able to get some help. Medics followed Tom to the wounded soldier, saving his life. His was not the only life Tom saved, and he became a valuable member of his unit. Tell was embedded with the German Army on the Eastern front. While advancing into enemy territory, Tell alerted them to a Russian “ambuscade,” or ambush. Through the dog’s warning, he was able to save an entire unit, earning him an extremely well deserved Iron Cross. On January 1, 1915 on the icy waters of English Channel, Imperial German Raider SM U-24 sent two torpedoes into the belly of the British battleship HMS Formidable. The wounds caused by the resulting explosions were too great and the warship capsized onto many of the survivors who were trying to swim away or escape in lifeboats. Of the 780 men who served on the HMS Formidable, 547 died at sea, including the ship’s captain and his war dog Bruce, a Fox terrier. The dog’s body would later wash ashore and was buried with honors. It was only the second battleship of the British Royal Navy to be sunk, and the public was shocked by its loss. However, from this sorrow came the incredible story of Lassie. Rescue boats from shore started picking up survivors from the sea, as well as the bodies of those who died. Local hospitals were overwhelmed, so the owners of the local hotel and pub, the Pilot Boat, offered to store the dead in its cold basement. As the sailors’ lifeless bodies were stacked up, Lassie – a local cross-breed collie – took notice of one of the men. She stayed by his body and would not stop licking his face. Unbeknownst to the men who pulled him from the sea and thought him dead, the sailor, John Cowan, was just barely clinging to life. Warmed by Lassie’s body and the constant licking of his face, Cowan was revived and Lassie was able to bring attention to his plight. He was taken to a hospital and eventually made a full recovery. According to the author of Shipwreck Guide to Dorset and South Devon Nigel Clarke, this incredible story was published all over the world. This then sparked the fictional story of a super dog, which would eventually take the form of Lassie of TV and Hollywood fame. Dogs didn’t always save lives during the war. Sometimes, they were also used as weapons. French officer Comte de Vaulchier described a German POW camp in Rastatt, Baden where German dogs were cruelly used to chase Allied prisoners out of their beds in the morning. Then at night, they’d do the opposite and chase the men back into their barracks. Not all German dogs were cruel. 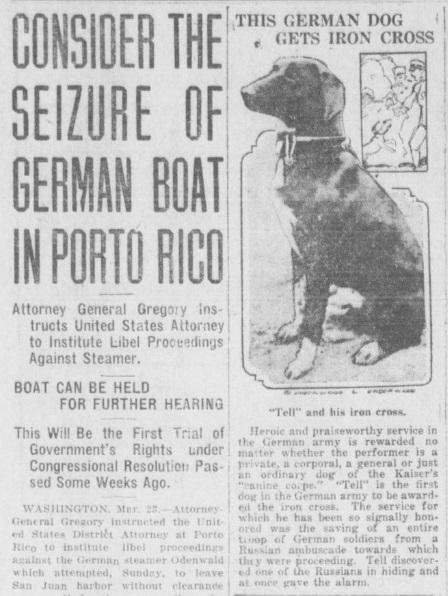 One fierce German dog was captured by the French. Refusing to leave his men’s side, this brave dog stayed in the POW camp, even wearing a German uniform. Rags was a stray terrier on the mean streets of Paris who learned not to trust humans. Then he met some unusual men, dressed in strange uniforms. They fed him, and Rags – sensing something about them – followed them to their camp. Unknown to Rags, these kind men were American soldiers. Homesick for their own pets, Rags was quickly adopted and, more importantly, loved and fed. For the first time, Rags had a stable life and refused to leave the Americans, even when they marched into the killing grounds of the WWI front lines. It was there, on the battlefield, that Rags repaid their kindness by raising morale. One soldier, First Sergeant James Donovan, taught him how to deliver messages. 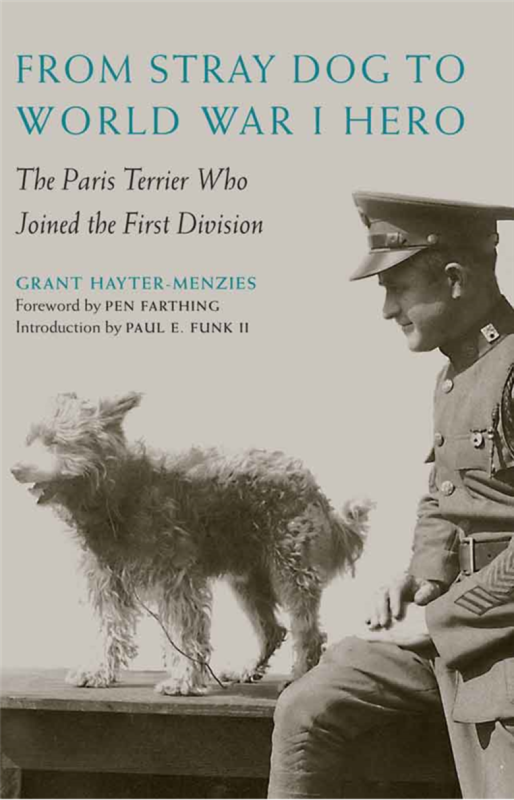 His biographer, Grant Hayter-Menzies, credits Rags’ successful delivery of these messages to saving the lives of “hundreds.” He even learned to alert the men of incoming artillery bombardments by flopping onto his side. Rags also developed a talent for finding the wounded among the battlefield dead. Eventually, he took too many wounds and had to retire from the front lines. He recovered, and after the war was adopted into an American military family. He lived until he was 20, and was buried at Aspin Hill Memorial Park in Silver Spring, Maryland. He was buried with great fanfare and military honors. The British Sherwood Foresters were on the front lines in 1918 when their unit became separated and they were encircled by German forces. The closest unit was almost four miles away. With no messenger birds, the unit’s only hope lay on the shoulders of a small soldier with shaggy black and beige hair, drooping ears, and four legs: Jack the Airedale (and no, that’s obviously not him pictured). With a message safely tied to his neck, he set off to HQ. Slinking from crater to crater, he was able to avoid most German fire. Unfortunately he wasn’t a ninja and was hit once, and then twice, by German bullets. The last bit of the journey, he could only crawl. With every bit of his final energy, he slumped into the British trenches dead, but the message was delivered and a whole battalion of Sherwood Foresters was saved. Philly, a stray mutt, first came into contact with the military at Camp George G. Meade near Middletown, Pennsylvania. Adopted by the men stationed there, she shipped off to France where, she fought in the trenches taking wounds and even being gassed. She was an excellent guard dog, and many German trench raids were disrupted by her keen ears. Philly gained such a reputation that there was even a German bounty of 50 Deutsche marks on her head. She survived the war and, when she died at 15-years-old, was stuffed and proudly displayed at the Philadelphia History Museum. During the Battle of Verdun, Germany was following a strategy of killing as many French soldiers as possible, bleeding France white. In all that chaos, one French unit was told to stand their ground until relieved. For days they did exactly that, but as they valiantly held their ground they lost communication with command. Running low on ammunition and wondering if they would survive, from the rear of their unit they saw a dog bounding toward them. The Germans saw it, too, and opened fire. First one bullet clipped the dog, and then another. As the dog got closer to the French, they saw that it was their messenger dog Satan. They urged him on and, inspired by their voices, Satan pushed on and braved a hail of bullets, falling into the trenches. On his back were two messenger pigeons. The French wrote down the coordinates of the German positions and released the birds. One was shot down right away, but the other made it back, allowing French artillery to hammer the Huns and save the day.